Virgin boss Sir Richard Branson says his train business could disappear from the UK after its partner Stagecoach was barred from three rail franchise bids. 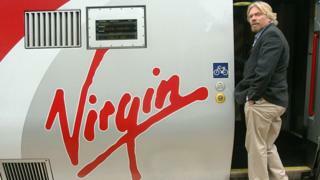 Sir Richard, whose Virgin Trains is 49% owned by Stagecoach, said he was "devastated" by the disqualification. Stagecoach had also applied for the East Midlands and South Eastern franchises, both of which have been rejected. In a blog on Virgin's corporate website, Sir Richard said Virgin Trains "could be gone from the UK in November". "We're baffled why the DfT did not tell us that we would be disqualified or even discuss the issue - they have known about this qualification in our bid on pensions for months," he wrote. "The pensions regulator has warned that more cash will be needed in the future, but no one knows how big that bill might eventually be and no responsible company could take that risk with pensions. "We can't accept a risk we can't manage - this would have been reckless. This is an industry-wide issue and forcing rail companies to take these risks could lead to the failure of more rail franchises." However, the DfT said Stagecoach - had "repeatedly ignored established rules" and that other bidders had met its requirements. The DfT's statement does not mention Virgin Trains. The DfT also announced that the East Midlands franchise had now been awarded to Abellio "after they presented a strong, compliant bid". The Pensions Regulator has estimated the UK rail industry needs an additional £5-6bn to plug the pensions shortfall, and the company said it was being asked to take on risks it "cannot control and manage". Rail firms have called on the government to help make up the pensions deficit. Mr Griffiths said: "Forcing rail companies to take these risks could lead to the failure of more rail franchises and cannot be in the best long-term interests of either customers, employees, taxpayers or the investors the railway needs for it to prosper." It was, he said, "more evidence that the current franchising model is not fit for purpose" and "further damages the already fragile investor confidence in the UK rail market". Stagecoach shares fell 9.3% in Wednesday trading. A DfT spokesman said: "Stagecoach is an experienced bidder and fully aware of the rules of franchise competitions. It is regrettable that they submitted non-compliant bids for all current competitions which breached established rules and, in doing so, they are responsible for their own disqualification. "Stagecoach chose to propose significant changes to the commercial terms for the East Midlands, West Coast Partnership and South Eastern contracts, leading to bids which proposed a significantly different deal to the ones on offer. As well as its stake in Virgin Rail, Stagecoach also runs the Sheffield Supertram.